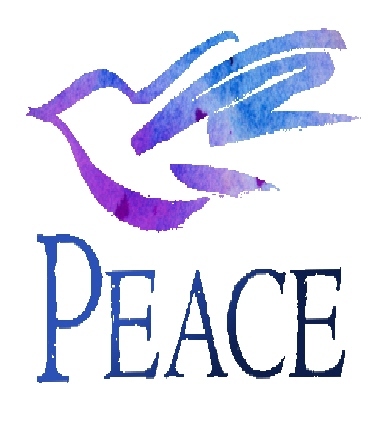 Peace–we all want it. We want peace and security in our homes, our church, at work, in our communities. Government leaders and diplomats spend their careers promoting it on a national and international levels. They go to conferences to diligently seek peace and security, but often with disappointing results. We hear claims that we can find peace through meditation, through positive thinking, through yoga, and through religion. All of these do not produce the kind of peace our hearts need, but leave us searching for what is genuine. True lasting peace is found in a personal relationship with our Creator God this God’s Son, Jesus Christ. Jesus promised, Peace I leave with you; My peace I give you. Don’t let your hearts be troubled and do not be afraid. We receive Christ’s peace when we recognize that sin creates a barrier between us and God, a barrier we cannot penetrate. Jesus Christ can provide the reconciliation we need by making peace through his blood, shed on the cross (Colossians 1:20.) We receive Christ peace when we place our faith in Him alone. Whenever someone asks me what the peace of God looks like I share a story of an experience I had when I was 13. I went to my first national youth event of the former UELC at Dana College in Blair, NE. My feelings of peace and security had been deeply affected by the sudden death of my father. One of the main sessions focused on the issue of understanding God’s peace. The session was led by a religious artist. As he talked to us, he was painting on canvas. His work of art was revealed a cliff of a mountain, with flashing lightening and daytime driving rain storm battering that mountain. With his brilliant strokes you could almost feel the intensity of the raging storm. As he was nearing completion of the canvas, he began to focus on one of the crags he had created in the mountain side, and just inside the crag of the mighty rock face, protected from the raging storm, wind and rain, he painted a brilliant colored song bird chirping his heartfelt praise… to the God who created him. I think that experience is linked to my love of Isaiah 49:15: I will never forget you, for I have carved you on the palm of my hand. Peace is a Person! We find eternal peace with God ( Jehovah Shalom) when we commit our lives to Jesus Christ, (the Prince of Peace) as revealed to us by the power of the Holy Spirit! Jesus, thank you for the peace of mind and heart that you rain down on us. In the midst of our circumstances, we want to receive your peace for our lives. Help us to keep our eyes fixed firmly on you and to enter into your peace. Amen. ← Can’t You Just Feel It in the Air?